Water testing will help you understand your pH. The pH of your water will affect the nutrient uptake by your plants. Ideally if your system is running between pH 6.5 and pH 7.5, your plants and your fish will be happy. A stable pH for your fish is very important as it is the sudden changes in pH that will stress fish. The stability of your pH will depend on your water hardness. If your water is soft, the pH will swing rapidly which is dangerous for fish health. Your water will have more stability if it is slightly hard. This can be assisted by adding Crushed Sea Shells to your system or natural limestone. The shells or limestone will create that buffer. 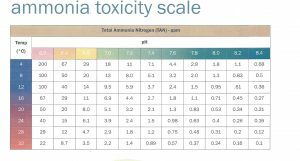 This chart will allow you to be able to work out if your ammonia levels are toxic to your fish in your individual system. Ideally, a zero reading is what you would like to achieve in a cycled system. Ways to reduce Ammonia in your system. 2. STOP feeding your fish. 3. Put your pump on full time. 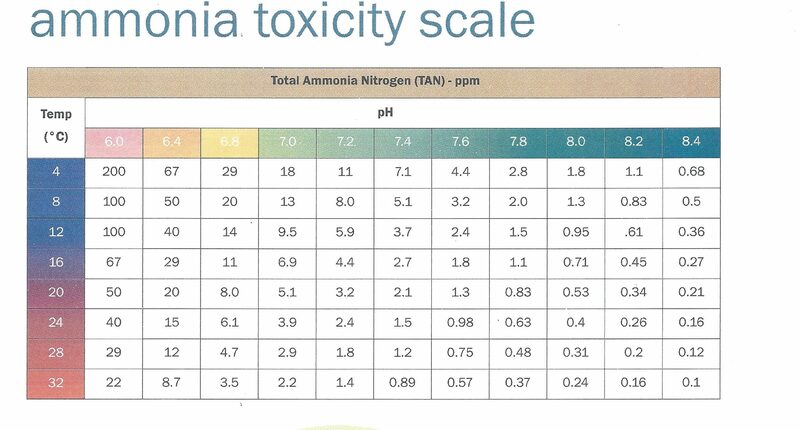 After you have had a spike in Ammonia, you will see your Nitrites increase. Hopefully, your system is cycled and ready to convert these Nitrites quickly into Nitrates for your plants to take up. Nitrites can have an effect on fish if they are not broken down in your system. The Nitrites are lethal to fish at much lower levels than ammonia. Nitrite poisoning at low prolonged levels can be a slow death for fish. Nitrite poisoning in fish is sometimes known as Brown Blood Disease, as the blood can no longer carry oxygen. Increases in Nitrites will cause an increase in Methemoglobin in fish blood stream which renders the blood unable to take up oxygen. Fish will eventually die of asphyxiation or a slower death from fin rot,ich or other diseases due to a lowered immune system. If you think your fish may be affected by high Nitrites ADD some Aquarium salt as this will prevent build up of Methemoglobin. Ways to reduce high levels of Nitrites. DO NOT overstock your system. 4. Water change by 1/4 of the volume. Nitrates are the end product of the conversion of Ammonia . The Nitrates are used up by your plants. Ideally, no higher than 80ppm is perfect for a system even though 100ppm and higher is often fine for fish. Blotchy or ulcerated skin can be caused by very high Nitrates . Higher levels of nitrates can restrict produce beautiful leafy growth but can prevent fruiting. Do not panic if you are showing zero nitrates. If your plants are growing like crazy then they are taking up every bit of Nitrate produced. If your plants are struggling and you have no Nitrates, your cycle may have broken. Time to start again ,slowly!